Villa with 3 bedrooms with terrace and garden, for 6 people. Detached house with 3 bedrooms, living room, 2 bathrooms, kitchen, 1 covered terrace, 1 outdoor terrace, garden, barbecue. The house is built on a plot where there is also a small apartment for the maintenance staff, which is separated from the house and has independent access. This apartment is not available to guests. Family beach 66 yards from the house. The house is located in a quiet residential neighborhood. In a minute and a half on foot you reach the sand on the beach. This has hammocks, umbrellas and bar service. Next to the beach, there is a small supermarket and two restaurants, one of them of high quality. Village center 10 minutes walk, with all kinds of services: Bars, restaurants, supermarket, shops, taxis, banks, rent a car, medical services, sports facilities, etc. Portals Nous / Bendinat is a high standing tourist area, with several beaches and all kinds of services. In the vicinity of 2 km: Puerto Portals (with all kinds of luxury tourist offer), golf course, sailing school, tennis courts, delfinarium, beaches. Access from the airport (20 minutes by car) and from Palma (15 minutes), by motorway Palma-Andratx, exit Bendinat. Airport bus Palma-Palma and Portals Nous. 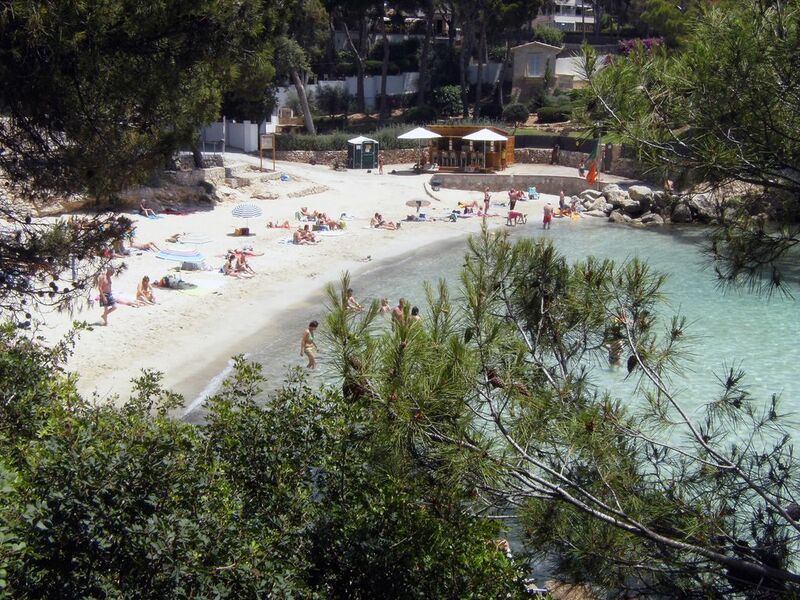 Ideal to enjoy the beach and the sea during the day, and the nightlife in Puerto Portals. Book time to visit Palma. In spring and autumn, possibility of hiking through the surrounding mountains, with magnificent views. Itineraries for cyclists. There are two stops of the public transport bus, which connects Portals Nous with Palma and with the other tourist centers of the municipality (Palma Nova, Magalluf, Santa Ponça, Peguera, etc). In the Plaza de Portals Nous there is a taxi service. There are also two rent a car companies. If guests have their own vehicle, they can park for free in front of the house and in all the surrounding streets. It is recommended that guests take a walk to Puerto Portals, where in addition to impressive yachts, they will find a wide variety of bars, restaurants, clothing stores, jewelers, etc. My name is Toni and I am the owner of the chalet. I personally manage the property, so I offer clients a friendly and personalized treatment. I live near the house, so I can attend to travelers quickly, if necessary. A lovely home in a beautiful area. Thank you very much, Peter, for your kind comments. You and your family will always be welcome at my house. We found this little gem outside of the main city and as we had never been to the island, we were not sure if the location was ideal, but we were so delighted with everything about this house. Toni is amazing; he was so helpful with check in and out, and directed us to some wonderful restaurants and cultural sites. The house itself was perfect in every way; the gardens are just beautiful and it is literally three minutes to the beach, yet quiet and peaceful. We are planning another trip to Mallorca next spring and this is definitely where we will be staying. You will love this home. I must warmly thank Mari for her kind words and I hope to welcome her and her family again in a next occasion. the owner Toni was very accommodating and we all enjoyed staying at his villa very much albeit for the beds which were not very comfortable. i would recommend a mattress topper. The location was spot on and only a short walk to the fabulous beach, a longer walk in the evening but not a problem at all and a cheap taxi ride home for less than 4 euros. Thanks to Sharon and in general to all our guests for their comments, they every year help to improve their stay in our property. To apologize to Sharon for the existence of mosquitoes in the area during those days, due to recent rains and excessive heat in later days. I always recommend to my clients to avoid having lights on with windows and doors open at night, to avoid entry of those insects into the house. beach is very nice, clean and very close to the house. The house is very nice and it is a very quite neighborhood. We would love to come again." Das Haus entsprach in vollem Umfang den Bildern und der Beschreibung. Sehr schön ist die besondere Lage des Hauses. Von hier aus sind es nur 60 Meter zum nächsten Strand. Der reine Sandstrand selbst liegt in einer romantischen Badebucht und ist für die Inselverhältnisse sehr ruhig (September 2017). Vom Haus aus kann man auch fusslaufig alle Geschäfte, Restaurants und öffentlichen Bushaltestellen erreichen. Schönes Haus mit privatem Charakter, wunderschöner ruhiger Garten hinterm Haus, der Strand mit ruhiger Bucht nur 60 m entfernt. Der Vermieter war sehr freundlich und hilfsbereit, insgesamt eine empfehlenswerte gute Wahl. The public transport bus connects Portals Nous with Palma and with the other tourist centers of the municipality (Palma Nova, Magalluf, Santa Ponça, Peguera, etc). There are two stops, located in the Plaza de Portals and at the end of Avenida de América.